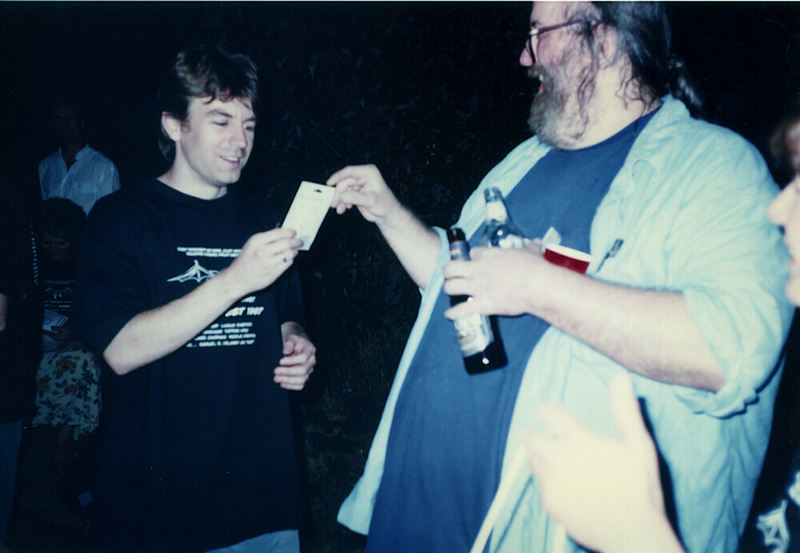 Lucius Shepard bestowing gift to Bob Kruger at last Clarion West ’97 party. Two people who meant a lot to my creative development have died in March, the same month in which I was born. Jack Hardy, March 11, 2011, and now Lucius Shepard, March 18, 2014. I know that the dates are meaningless, but I can’t help attributing meaning to the coincidence. I’ve written about Jack here and here. Jack and Lucius both taught me some things about being a writer, being a creative person in the world. They were both large figures (Lucius physically, Jack not). They were people who didn’t like crap being revered as art and didn’t mind talking about it. They could alienate people. They both alienated me on occasion. But that doesn’t make me miss them less. They also would have been amused at some of the eulogies offered up, some by people they had no use for. And perhaps embarrassed by tributes from people they cared about, like Michael Swanwick’s beautiful post about Lucius here, or David Massengill on Jack. Jack and Lucius never met and likely never knew of each other’s existence. I could have, but never did, give either of them something to read or listen to. I didn’t know if they would like it. Lucius wasn’t much interested in folk music, though I think he would have appreciated Jack’s art of language. Jack probably read Lucius’s introduction to my novella, In Springdale Town, but I can’t remember if we ever talked about Lucius and his fiction. I invited both to my wedding. Jack came, and sang his incantatory “The Wedding Song” from his album The Hunter. I don’t think Lucius ever acknowledged receiving the invitation, which was okay; I hadn’t expected him to come, and I didn’t think the town would have been large enough to hold both of them. Also, Yellow Springs wasn’t a place Lucius wanted to visit; his ex-wife went to college here. Lucius taught my third week at Clarion West in 1997. Clarion is a six-week workshop mostly for fantasy and science fiction writers. I imagine it’s not an easy job. There are egos involved, and exhaustion, and a lot of writing. Some teachers are more aloof, some take on a role of parent or guardian, some bring the bourbon. But Lucius didn’t just drink with us. He offered critiques, he pushed, he advised. For my story “Suspension,” which I wrote the first week and he read later, during his week, he recommended changing it from third to first person, a change that led the revisions along unexpected paths and to eventual publication. His introduction to In Springdale Town was a mini-essay about the problems of teaching an intense group of individuals and the perils of attempting to predict success. Some reviewers had problems with the introduction, not understanding (or not caring) that it was a glimpse inside him. Reading it always makes me feel better. Lucius experienced a multitude of health issues over the last few years, but always appeared ready to fight back and return to health and productivity. This time, he didn’t. I’m tired of writing about people who died.